LG UP970 4K Blu-ray player tipped for CES 2017 launch | What Hi-Fi? 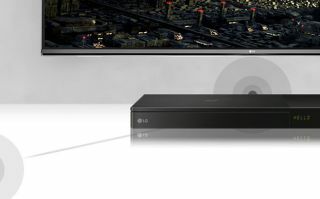 It looks like LG's first Ultra HD Blu-ray player could arrive at CES in January. We're expecting to hear plenty about Ultra HD Blu-ray at the world's biggest tech show, CES 2017, in January, and here's our first sniff of some 4K Blu-ray news courtesy of LG. German website 4KFilme has spotted what appears to be a new product listing on the database of the Wi-Fi Alliance, an organisation that checks new wireless products conform to all the necessary standards. The listing is for an LG UP970 - a model name which looks pretty similar to LG's Blu-ray players (one of which is listed above), but for a 'U' instead of a 'B'. An Ultra HD Blu-ray player instead of a Blu-ray player? It would make sense. Other than being WiFi-enabled and offering support for the Miracast streaming standard, there's not much else to be gleaned from the WiFi Alliance listing. It would be the first player from LG to support the new disc format, and would join offerings from Panasonic and Samsung. We'd expect it to be similar in price to the Samsung UBD-K8500, which launched at £430 but is now widely available for under £300. Back in September Sony unveiled its first 4K Blu-ray player, the UBP-X1000ES, which was aimed at the custom-install market. Will we see a more affordable, consumer-aimed Sony 4K Blu-ray player at CES? We certainly think so. We'll be reporting live from CES in Las Vegas in January, bringing you all the important news, plus hands-on reviews and videos.